If youve been searching for a friendly village or town, surrounded by commanding mountain and sea views, offering an unbeatable selection of performing arts festivals and workshops, then look no further. Port Townsend, Washington has it all. The town humbly calls itself a "Victorian Seaport and Arts Community." Its location at the northeast corner of the Olympic Peninsula makes it truly unique, surrounded by glacier-covered Olympic Mountains and the waters and islands of Puget Sound. The weeklong summer arts workshops and weekend arts festivals include symphony, chamber music, jazz, blues, dance, readings and lectures, fiddle tunes, and more. Join me for a review of Port Townsends summer offerings. Because of my addiction to the town and to jazz, I make an annual pilgrimage to Port Townsend for the Bud Shank Jazz Workshop and Festival. The weeklong workshop held at historic Fort Worden provides master classes for each type of instrument, a range of classes on music theory, daily practice with a jazz combo, and a public performance with that combo at week's end. An associated jazz festival features performances by world-renowned jazz musicians such as John Clayton, Bill Mays, Ron Eschete, Alan Broadbent, and Bud Shank performing both in the local bars and in 1,400-seat McCurdy Pavilion. From Monday to Friday I intermingle my days at the workshop with afternoons bicycling with my wife through the town or along the shore, lounging on the beach, or kayaking in the sound. 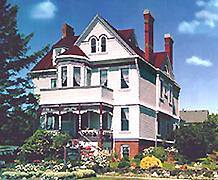 We enjoy touring the Victorian house-lined streets and sampling the cuisine at a good selection of restaurants. Evenings are often spent in spur-of-the-moment jam sessions with other workshop participants. As we say goodbye at the end of the week to acquaintances both old and new we never fail to make our pledges, "see you again next year!" The other performing arts workshops also have rave reviews by their participants, be they fans of classical music, blues, country, dance, or literature. The 8,500 residents of Port Townsend are proud of the towns Victorian village atmosphere. The main thoroughfare, Water Street, borders the sound with an array of vintage hotels, shops, galleries, restaurants, and coffee houses. The bay is filled with sailboats from two neighboring marinas and fast-moving ferries that cross Puget Sound with connections to Whidbey Island. 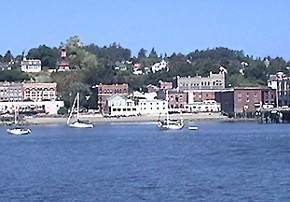 The town rises from the bay via several scenic streets lined with Victorian homes dating from the 1860s to 1890s when Port Townsend was a major seaport. Most of the homes were built on the speculation that a railroad would bolster the economic boom, but when the line was canceled, the boomtown went bust, leaving the legacy of a museum town. A few blocks from the waterfront area sits Lawrence Street, the upscale mercantile lane harboring back to the days when upper class folks of Port Townsend created their own street for shopping and dining away from then rough-and-tumble Water Street. A perfect way to while away a morning or afternoon is to walk or cycle the square-mile network of streets, named after U.S. political figures such as Jefferson, Franklin, and Calhoun, and appreciate the architecture of over one hundred colorful and fully restored Victorian homes. Port Townsend sits in the rain shadow of the Olympic Mountains, receiving but 16-18 inches of rain per year. The summers here are superb for bicycling, hiking, kayaking, sailing, and other outdoor pursuits, with a number of outlets available for renting equipment or booking a tour. Since the town is surrounded by salt water on three sides, there are plenty of places for interesting sails and paddles, including nearby Marrowstone Island. The town is also close to Olympic National Park with its unique temperate rain forest of Sitka spruce and Pacific Ocean shoreline. Also nearby is Port Angeles with ferries to Victoria, British Columbia and access to Washingtons San Juan Islands. Many outdoor activities are available within the city limits due to a range of parks and seashores, including Fort Worden State Park, once a military base and site of the filming of "An Officer and a Gentleman." The fort sits on the northern side of the town with inviting beaches on both sides of Point Wilson with its U.S. Coast Guard Station and Light House. For over three decades, Centrum, Washingtons Home for the Creative Arts and Creative Education, has flourished in its role as a haven for creative pursuits, welcoming people from across the country and internationally. 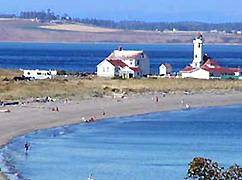 The center is located at Fort Worden State Park, only three miles from the downtown district. Dormitories, classrooms, and performance rooms are situated in renovated military buildings. The fort also houses McCurdy Pavilion for public performances associated with the major weekend festivals that provide a finale to each weeks workshop. The Fort offers panoramic views of the Strait of Juan de Fuca, two mountain ranges, and its own saltwater beaches and wooded trails. Workshop participants can stay in the dormitories or at nearby hotels or B&Bs. Weekend festival tickets are generally included with the workshops. Tickets are available for purchase by other visitors who do not participate in the workshops. Nothing speaks louder for Centrums offerings than a brief list of each summers events. But the proof is in the pudding. More than half of the participants at each years arts workshops are returning from previous years for another session. Give it a try yourself; you will likely be one of those who says to other participants "see you again next year!" 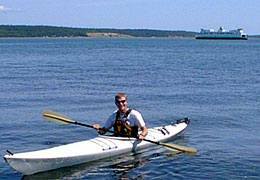 Click here for details to plan your own trip to Washington State's Port Townsend.